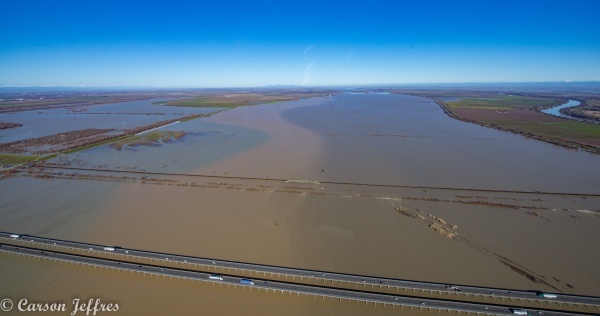 The floodplains of California’s Central Valley and the tidal wetlands of the Delta have been dramatically reduced in the last 150 years, with both habitats types experiencing approximately a 95% reduction in historic areas. This fundamental change in habitats has potentially shifted how food webs function in the rivers, floodplains, and tidal wetlands. We hypothesize that the loss of floodplain and tidal habitats has changed the aquatic food web from a mixed detrital and autochthonous system to primarily an autochthonous system. This has resulted in a reduced flow of carbon through the food web and thus reduced ecosystem productivity. When incorporated into the riverine system, the heterotrophic or detrital based food web may contribute a significant portion of trophic energy to higher-level consumers in floodplains and similar habitats where detrital contributions are large. Previous studies in the California Delta and floodplains have shown that phytoplankton is a significant source of carbon for grazing zooplankton and ultimately higher level consumers. However, these previous studies lacked direct measures of resource utilization by zooplankton in situ and thus our understanding of the detrital food web in the various habitats of the Delta is unresolved. Recent evidence from surrogate floodplains in the Yolo Bypass show that high zooplankton densities and increased juvenile Chinook salmon growth is supported by a heterotrophic food web. It is important to understand the contribution of both the autotrophic and heterotrophic food webs to primary and higher level consumers in floodplains and freshwater tidal habitats to guide restoration and land management actions, and for planning for future climate scenarios. This project addresses the need for an increased understanding detrital food webs in the North (Yolo Bypass downstream) and Northeast Delta (Cosumnes River and downstream) by use of stable isotope tracers. The use of stable isotopes, Bayesian stream metabolism modeling, and detailed environmental data will offer a high-resolution understanding of carbon flow within and among floodplains and tidal fresh water habitats. Stable isotope tracers will be used to elucidate spatiotemporal food resource utilization by zooplankton and changes in zooplankton community composition in relation to resource changes. This research will support the priorities of the EcoRestore program where more than 30,000 acres are targeted for restoration into wetland, floodplains and tidal habitats. A better understanding of the physical processes and resulting food webs within these habitats will allow for better prioritization of restoration locations and expected ecosystem benefits.